Downgrade iOS 9.3 to iOS 9.2.1 hassle-free: Being techies, we wish to get iOS 9.3 updates ASAP.You may get iOS 9.3 ipsw download very easily and upgraded iOS 9/9.1/9.2.1 to 9.3 without activation fixes.You may face iOS 9.3 upgrade issues like iOS 9.3 activation problems.To avoid them, you can downgrade iOS 9.3 to iOS 9.2.1 on your iPhone/iPad/iPod Touch by iOS 9.2.1 ipsw download without activation problems. Check this site to download iOS ipsw for iOS 9.2.1/9.3 ipsw firmware files. Very soon, you can download official Apple’s iOs 9.3 ipsw firmware files from Techslates. This techslates guide helps you to downgrade iOS 9.3 to 9.2.1 only to avoid activation problems using iOS 9.2.1 ipsw download.Apple Inc., won’t recommend to downgrade iOS. 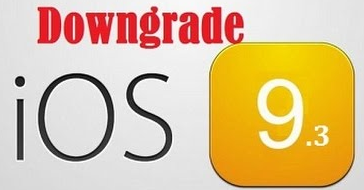 You cannot downgrade iOS 9.3 to iOS 9.1 or iOS 9 because Apple is not signing iOS 9.1/9 as on 27-Mar-2016.This downgrade guide will be useful till Apple allows signing iOS 9.2.1 ipsw file to downgrade iOS 9.3 to 9.2.1. Generally, iOS users upgrade iOS using ipsw(iPhone S/w) firmware files.This guide is meant for people who upgraded iOS 9.2.1 to iOS 9.3 accidentally or by downloading iOS 9.3 ipsw firmware files.I remind you that downgrade from iOS 9.3 to iOS 9.1/9 is not possible by iOS 9.2.1 ipsw download.Its better to stay on 9.2 because pangu iOS 9.2 jailbreak is in its way.You may not make use of pangu jailbreak if you upgrade iOS 9/9.1/9.2 to iOS 9.3. Check if Apple supports signing your iPhone/iPad/iPod Touch iOS 9.2.1 here. Look for a Green Tick mark in the “Apple Signing Status Column” across your Apple Device row. Proceed further if you find green tick mark.It tells you that you can downgrade iOS 9.3 to iOS 9.2.1 using iOS 9.2.1 ipsw download without activation problems. Back up your iPhone/iPad/iPad touch data to iCloud/iTunes. Proceed at your own risk, as downgrading iOS updates is not recommended officially using iOS 9.2.1 ipsw download. You can downgrade iOS 9.3 to iOS 9.2.1 by below two methods.Follow any one of the downgrading methods, I would prefer Method1 to Method2 by iOS 9.2.1 ipsw download. This downgrade method uses Device Firmware Upgrade(DFU) mode. DFU mode lets you to connect your iPhone/iPad/iPad Touch to iTunes, but does not load iOS bootloader.This method also allows you to restore your back up data from iCloud/using iTunes. This is a time-taking method to downgrade iOS 9.3 by iOS 9.2.1 ipsw download, yet recommended. Step#1:To upgrade iOS 9.2.1 to iOS 9.3, you might have downloaded iOS 9.3 ipsw firmware files to PC or mac.In the same way, to downgrade to iOS 9.2.1 by iPSW firmware files, you need to get restore ipsw firmware files/iOS 9.2.1 ipsw download files specific for your iPhone/iPad/iPod touch based on your iDevice model/model ID and build ID(can be found at back of iDevice). Note: If you are using safari browser to download downgrade 9.3 ipsw firmware files, ensure that you unchecked auto unzip feature of safari. Step#3:You can see your iDevice connected on top left corner of iTunes Screen. Step#4:Now, its time to keep your iOS 9.3 running iPhone/iPad/iPod touch into DFU mode.Plug your iDevice into PC and follow how to keep iDevice into DFU mode guide to connect your iDevice to iTunes on computer.This is the recommended method to downgrade iOS 9.3 to 9.2.1 using iOS 9.2.1 ipsw download without activation fixes/problems. Step#7:If you are using iTunes on Windows 10/8.1/7 PC, hold Shift key and Click Restore iPhone/iPad/iPod Touch in the iTunes screen. If you are using iTunes on Mac OS X , hold Alt/option key and Click Restore iPhone/iPad/iPod Touch in the iTunes. Step#8:Browse for the downgrade iOS 9.3 update ipsw/ iOS 9.2.1 restore ipsw firmware file, you initially downloaded and select the file. Step#10:You will get popups showing ipsw firmware file info.Click Next and Agree to Terms and conditions to downgrade iOS 9.3 to iOS 9.2.1 without any activation problems. Step#12:After successful downgrade, A white welcome screen will appear and follow the on-screen instructions.The instructions will let you to restore back up data to your newly restored 9.2.1 iOS. Finally, you have downgraded iOS 9.3 to 9.2.1 without activation issues easily. This downgrade method helps you to quickly get iOS 9.2.1 from iOS 9.3.We wont use DFU mode in this method to downgrade iOS.Instead, we circumvent this with a trick. You may not restore data from back up in this downgrade process.So, This method is not recommended, as you install fresh iOS 9.2.1 from iOS 9.3 updates with activation sign in.Have good internet connectivity to download iOS 9.2.1 for this method to avoid downgrade iOS 9.3 to iOS 9.2 problems using iOS 9.2.1 ipsw download. Slide and enter your apple credentials to continue the post-downgrading iOS 9.3 process.You may be asked to activate iOS 9.2.1 using Apple ID credentials. This method don’t need iOS 9.3 ipsw firmware files download.This downgrade iOS method won’t support back up retrieval unlike iOS 9.3 downgrade method1.This techslates guide will help you to downgrade from iOS 9.3 to iOS 9.2.1. You may face few errors like “This device isn’t eligible for the requested build” during downgrade process.To avoid this error while iOS 9.3 downgrade, download correct ipsw firmware files for your specific iPhone/iPad/iPhone. If you face any problems to downgrade from iOS 9.3 to 9.2.1 (not iOS 9./9.1) , please let us know through comments.Our techslates team will resolve your iOS 9.3 downgrade issues and also let you download iOS 9.3 ipsw download.